Proofreading is greatly in demand, and finding legitimate online proofreading jobs for beginners has never been this easy before. This is a great time for proof-readers and editors to seek various job opportunities and earn money online, sitting at the comfort of their houses. The demand for online proofreading jobs has increased due to the growing market for online content marketing. There are many blogs and online businesses that need proof-readers to edit and proofread their content. You can come across plenty of online proofreading job opportunities on the internet. Proofreading is a great way of making money online. You can either join as a full-time proof-reader or as a freelancer, the choice is yours. If this is what interests you, I can say you are in the right place. So, Is Proofreading For You? How Much Can Proof-readers Make? How To Become An Online Proof-reader? Proofreading basically refers to the task of making a content perfect that is written by someone else. This includes correcting the grammatical mistakes like common spelling errors, misplaced commas and the like. It is true that there are several online proof-reading tools available online. But they sure don’t work as fine as the human eye. Before you start your proofreading career, you need to find out whether you have the required skills for the field or not. Here are 3 simple ways through which you can tell whether you are good with your proofreading skills or not. Are you good with identifying typos and spelling errors in articles? Do you have the habit of correcting posts on social media? Do you have good knowledge of grammar and punctuation? If you can perform the mentioned tasks with ease – you’re all set to become a professional proof-reader. Working as a freelancing proof-reader can get you really good money. You can work for various sites especially the ones that pay a good amount. Working for multiple sites at the same time can help you to generate a good amount of income. According to Glassdoor, a proof-reader can earn up to $36, 290 per year on an average. If you are really good with your work this figure can go up to $61,874 annually. 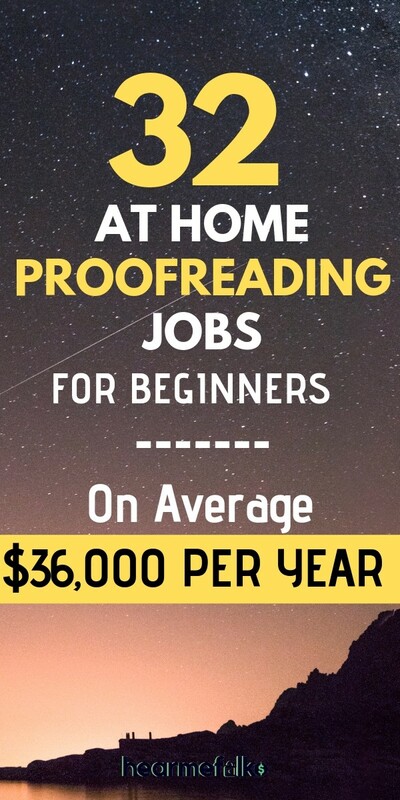 There are some entry-level freelance proofreaders earning over $40,000 working for themselves and loving their jobs. If you wish to become a proof-reader, all you need to do is work on your skills and apply to various online proofreading companies to get hired. This way you will be able to make a good income right from your home. Sometimes it’s pretty intimidating to start something new. How many of us have been in that place? But, luckily you won’t have to figure it out alone. I want to showcase you an opportunity you can’t say no to! Caitlin Pyle (former freelance proofreader) over at ProofreadAnywhere is one of the most talented proofreaders out there… and she has compiled all of her knowledge into a comprehensive course. And, fortunately, you can gain access to her workshop for FREE. She’ll teach you the basics of proofreading to make sure you’re a word-skills SUPERSTAR. After you master the skills, she’ll show you how to turn this newfound knowledge into a profitable business. You’ll learn exactly how to find clients, structure your work days, and run a successful proofreading business. You can use your proofreading skills to prove your mettle in the following 4 online editing jobs. These jobs can get you a really good income. 1. Transcription: The work of a transcriber is to convert audio files into text. You need to have good listening skills. Your proofreading skills can be put to good use in this field. 2. Freelance writing: Every author and writer needs their content to be proofread. As a proof-reader, you should be able to detect the errors and correct them. You can offer your service on various freelance websites. 3. Blogging: You can even start your own website to showcase your writing talent and generate a good income. 4. Sell a book: As a proof-reader, you should be able to create an error-free book for your audience. Interesting Read: Click to read this incredible success story of Peggy (Caitlin’s student) who makes $2,700 a month as a Proofreader. Here is a list of legit entry-level online proofreading jobs where you can apply to become a proof-reader. 1. Lionbridge: Lionbridge provides flexible work opportunities that meet the needs of the modern worker.To work for Lionbridge all you need is a high school diploma. They have very basic requirements for hiring candidates. 2. Babbeltype: You need to be a native English speaker in order to qualify to work with this site. You also need to have great grammatical knowledge. This is a great place for beginners to start their proofreading career. 3. Kirkus media: This site is mainly known to look for Spanish and English book reviewers. Each review is of 350 words and you are given time duration of two weeks from the book is assigned. You need to submit your work samples in order to get accepted by the site. required to sign up with them. 5. English trackers: The site has a job board directory which you can check from time to time in order to get updated about any vacancy. You can also sign up with them in order to weekly job listings which will be delivered to your email. 6. Scribe: The best thing about this site is that you can choose whether you want to work as a freelancer or a full-time proofreader. You can subscribe to the site to receive notifications on new job listings. 7. ProofreadingPal: You can earn up to $3000 per month buy working for ProofreadingPal. However, you need to have 5 years of experience to be eligible to work for this site. 8. Kibin: Kibin is a decent proofreading site but the problem is they hire proofreaders very occasionally. However, you can still visit the site and find out whether they are hiring or not. site. There can be better chances for you to get hired if you have prior experience in proofreading. 10. Scibbr: This site is known to provide a lot of opportunities to edit and proofread thesis and essays for students. If you think you have got the skill, you can definitely join this site for your benefit. 11. Domainite: This is yet another great proofreading site for the beginners. All you need to do is complete your application and then edit a sample to get selected. 12. Gramlee: This site has a strict deadline for completing the work. You need to complete the work assigned to you within 24 hours. However, there is a lot of opportunities to flourish on this site. Before you start, you need to complete your application process. 13. eCorrectors: This is a great site for both a translator and a proofreader to begin their career. All you need to do is submit your resume to get qualify and start working with the site. 14. Scribendi: You need to have prior experience in editing and proofreading to apply to work with them. This is one of the most popular proofreading sites that exist out there. 15. Managed editing: To be qualified to work with managed anything you need to have a College degree along with 5 years of experience in the concerned field. 16. Indeed: Indeed space around $25 to edit and proofread content for their clients. This is a good deal given the fact that you are a beginner. 17. Pure content: This is a great site for all freelancing proofreaders and editors. If you are equipped when the skill to perform both the jobs then you are most welcome to apply. 18. Wordy: Wordy is known to provide copy editing and proofreading services to its clients. If you wish to work as a freelancer you can apply to work with them anytime you want. All you need to do is register on their side to join as a freelance proofreader or editor. 19. OneSpace: This particular site provides you with both editing and proofreading jobs. You can receive instant payment from the site once you are done with the work. You can also make more money by performing Data Entry tasks. 20. Helloessay: This site mainly deals with editing and proofreading academic based essays. To apply to work with them you need to have a College degree. This is a great site for college students to begin their career in the field of proofreading. 21. Wordvice: To apply for Wordvice you need to have prior experience in proofreading. However, they do not state how many years of experience you need to be eligible. Most of the work provided by them include editing thesis, research articles, and essays. 22. Sibia proofreading: This proofreading site is known to hire candidates from time to time. You can keep a check on their site for current job updates. 23. Proofread now: To apply for proofreading now you need to have prior 5 years of experience in the field. You can also sign up then use later in order to get notified about the latest job openings on the site. you are a serious and experienced proofreader the investment is totally worth it. You can find plenty of legend deals on the site on a daily basis. You can even cancel your membership anytime you want. 25. Life tips: This is a platform that hires editors who can help them edit various content and books for the clients. The clients are mainly writers who are specialized in writing life tips. 26. IXL learning: This is basically an education based platform that is known to provide job opportunities to freelance editors and proofreaders. At times they also hire writers to work with them. 27. Polished paper: In order to work with the polished paper, you need to first submit your resume and also fill up the application form. After you submit the application form you will have to take a 35 questionnaire editor test. 28. Proofreadingservices.com: The best thing about this proofreading site is that you can apply to work with them from any part of the world. Before you begin your application process, you need to clear a 20 minutes preliminary test. 29. Words RU: The site is known to hire only experienced and highly qualified proofreaders from different countries. You need to be really skilled in your work in order to get hired by them. The site is currently looking for new proofreaders to join their team so if you think you have what it needs to become a proofreader, you can surely apply to work with them. 30. Editor world: This is a great site for proofreaders and editors. All u need to do is sign up on the site and list your services out there. Clients will contact you if they find your services to be useful. 31. Edit 911: To apply to work with edit 911 you need to have a Ph.D. degree in English. You can also apply if you are a professional writer. The site is known to provide editing and proofreading services to businesses, authors and more. 32. Writer’s relief: This is one of the most popular editing and proofreading sites to exist out there. Provide plenty of services which include editing books, documents and other related items provided by the clients. But the problem with the site is that day hire only the best out of the lot. You can work only if you are selected. Proof-reading can prove to be a lucrative career for you provided that you are really good at it. If you are serious about this career, don’t miss this free virtual workshop by Caitlin! There are plenty of job options out there where you can apply. Check out the mentioned sites and give a kick start to your proofreading career.